Leo Amoyan (HR manager of SMB), Girlie Garces (SMB head of Corporate Communications) and John P.
Last Friday night at the Makati Shangri-La, I received an award in behalf of the Sportswriters Association of Cebu (SAC). With me were three executives from San Miguel Brewery: Girlie Garces, heading Corporate Communications; Leo Amoyan, who leads Human Resources; and Bryan Garcia from SMB’s headquarters. SAC and SMB have been partners for 35 years. Each February or March, we recognize the Cebuano athletes and sportsmen who excelled in their respective games. And as you may have read last week, June Mar Fajardo copped the highest honor (Athlete of the Year), Donnie Nietes beamed a toothful smile as Hall of Fame awardee, Joy Tabal stood tall in her high heels, Jonel Borromeo was honored with the Presidential Award and Fred Uytengsu, born in Cebu in 1961, was our Sportsman of the Year. 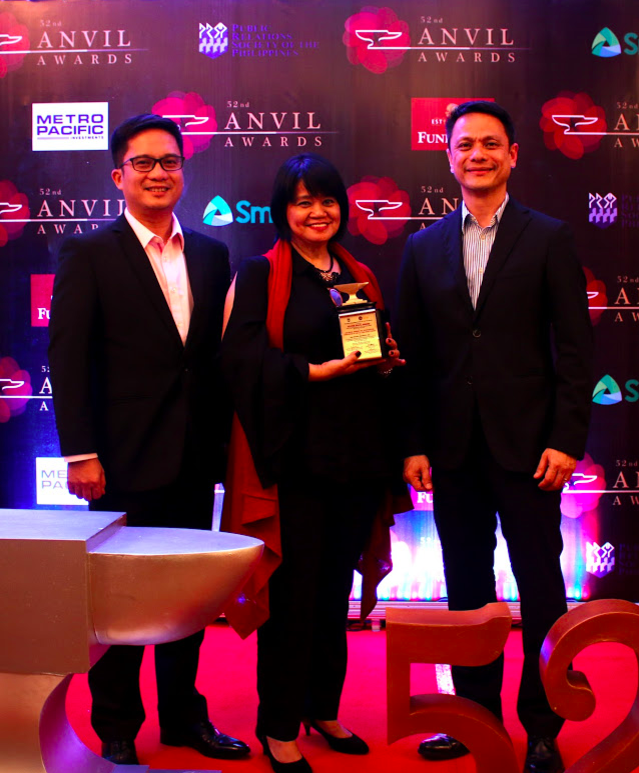 Back to last Friday, it was a glittering affair as SMB and SAC jointly received the Anvil Award. What’s an “anvil?” In plain English, it means “a heavy steel or iron block with a flat top, concave sides, and typically a pointed end, on which metal can be hammered and shaped.” Named after this block of iron, the Anvil Awards honors organizations and companies whose programs make an impact and are long-lasting. Why would a PR group recognize an awards body that honors athletes? Because of the uninterrupted partnership of San Miguel and SAC. Last Friday, we were seated by 4:45 p.m. Very early, I thought, for an awarding ceremony. It turns out that the program involves plenty of entertainment and speeches. Over a thousand beautifully-dressed ladies and gentlemen in coat-and-tie filled the Rizal Ballroom. The stage was huge and impressive. Large screen LCD sets swamped the backdrop. Some of the most celebrated of dance groups captivated the audience as Girlie, Leo, Bryan and myself enjoyed dinner that included salmon and corn-fed chicken. Joy Polloso, who heads the retail group of Filinvest, was seated at the next table as many of the nation’s top firms, including Smart, PLDT, Shell, PDI and Phil. Star, Page One and more were honored. Manny Pangilinan was in attendance. Finally, when the clock neared 9 p.m., we were called up on stage for that quick award acceptance. A short but memorable moment honoring 35 long and enduring years.